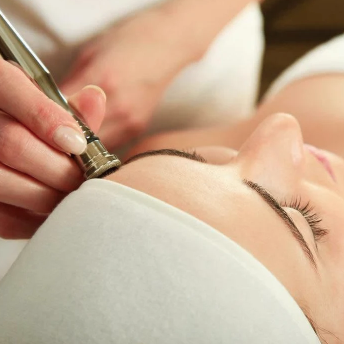 One of the most popular skin treatments available that is praised by women and men alike, no chemicals or anesthesia are used in this treatment. The diamond peel provides a non-surgical skin refinish by using sterile diamond heads to abrade or rub off the top skin layer, vacuuming out the particles along with any dirt and dead skin back up. This procedure removes skin debris, imperfections, blemishes, wrinkles, and unwanted pigmentation on the skin. Moderate usage of diamond peel, accompanied with skin products that penetrate the top layer of skin and reaches the dermis level, helping to replenish natural nutrients, restore cell activity, and promote skin health. The results of this treatment are usually healthy, glowing, beautiful skin. Recommended to treat dark circles under the eyes, crows feet, dehydrated or dry skin, fine lines and wrinkles, open pores, as well as dull skin that needs brightening. It’s great for acne outbreaks, scars, enlarged skin pores, and is used to restore uneven skin tones.